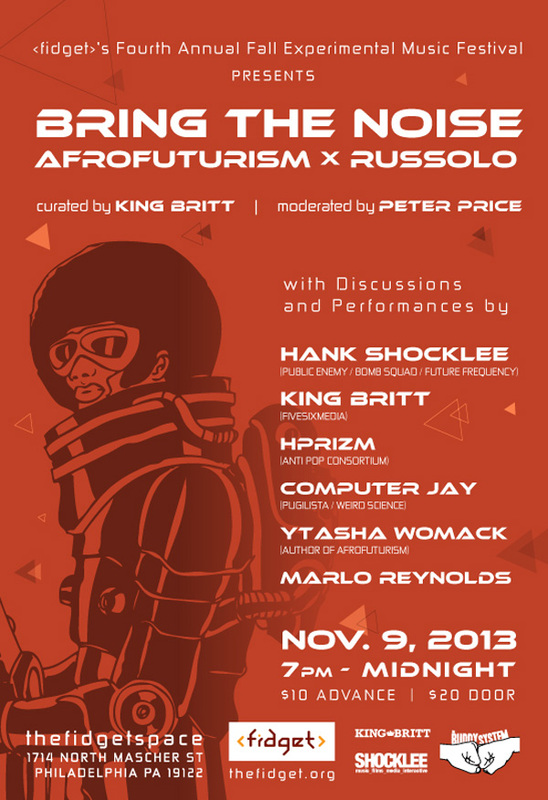 On November 9, 2013 < fidget >‘s Fourth Annual Fall Experimental Music Festival presents Bring the Noise: a conversation around Afrofuturism & The Art of Noise Manifesto. The event curated by King Britt and moderated by Peter Price will feature our own Hank Shocklee. Bring the Noise will provide a platform for the investigation of the current state of afrofuturist philosophy and aesthetics of experimental music. Around the time of the birth of hip-hop, the term ‘afrofuturism’ was coined to identify an aesthetic and philosophical orientation that had been growing within music and literature for some decades. Afrofuturism re-imagines the condition of afro-diasporic cultures through a lens of science fiction. In music of many kinds this orientation has provided a push towards experimental energies: consider the mytho-cosmic jazz of Sun Ra in the 60′s, the sci-fi funk of Parliament-Funkadelic in the 70′s, Afrika Bambaataa’s soulsonics in the 80′s and Dr. Octagon’s extraterrestrial surrealism of today. Special thanks to Philly’s own producer/composer, performer and curator King Britt for the invitation to this exciting event! Honored to have you and very excited for this!